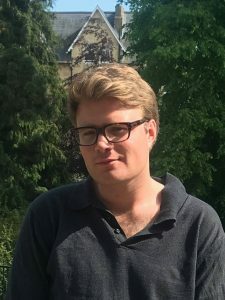 Matthew Ward is an Oxford DPhil History Candidate, Vincent Packford and Geoffrey Smart Scholar, Kellogg College. His research looks at Anglo-Irish political thought in the seventeenth and eighteenth centuries. He is particularly interested in the English political philosopher Thomas Hobbes and his reception in Ireland. He will be speaking about his work at the ECIS Annual Conference on 8-9 June 2018. I recently enjoyed a visit to Armagh Robinson Library to consult the Dopping Papers. The De Vesci Collection at the NLI is also amazingly rich. I really love the Kafka Museum in Prague. The newly refurbished Abbeyleix Heritage House is also very charming. The 1794 Treason Trials in London. Though it might be a rather obvious answer, I couldn’t do without the pamphlet and sermon material available on ECCO (Eighteenth Century Collections Online). John Robertson, The Case for The Enlightenment. What eighteenth century figure would you most like to have a drink with? John Abernethy Sr. Though his might be an orange juice. What will you be talking about at the ECIS Annual Conference 2016? My paper will offer an interpretation of Edward Synge’s The case of toleration (1725) and the debate it sparked in Dublin’s public prints. Synge was Prebendary of St Patrick’s, chaplain to the Lord Lieutenant, and was later promoted to the episcopal bench. Though he sprung from the heart of Ireland’s clerical establishment, he was a critic of the penal laws and enjoyed a close relationship with the Presbyterian philosopher Francis Hutcheson. In The case, Synge objected to the use of force to discipline religious disobedience and alleged that the Irish penal laws embodied the coercive politics and religion of Thomas Hobbes in De Cive. Synge’s characterisation touched a nerve in his Anglican critics who responded by identifying the Hobbesian aspects of his own argument. Showing how Hobbes set the terms of discussion of the penal laws in the 1720s, will allow me to draw broader conclusions about his Anglo-Irish reception and the intellectual culture in which he was received.